I have many fond memories of Sörbyn Lodge. What an excellent place to come back to after an exciting day outdoors! The hospitality is fantastic and the food is seriously good, making it a great base for a tailor-made holiday. 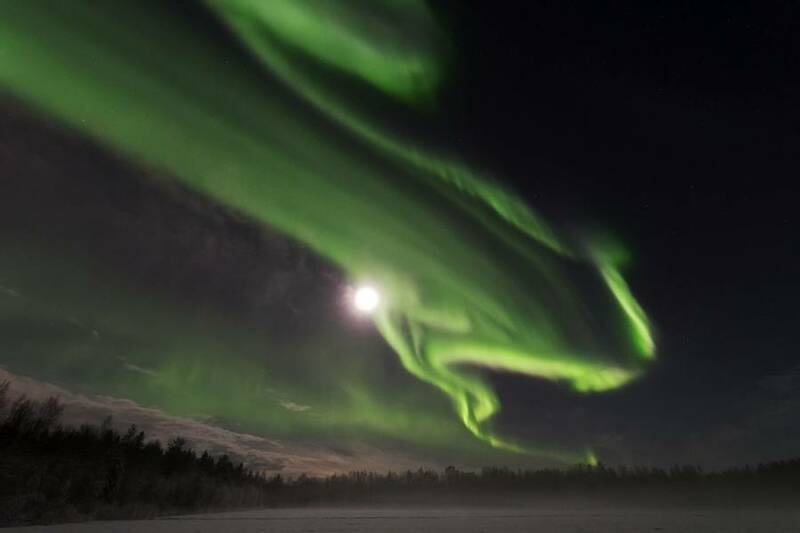 It also has brilliant Northern Lights viewing potential! 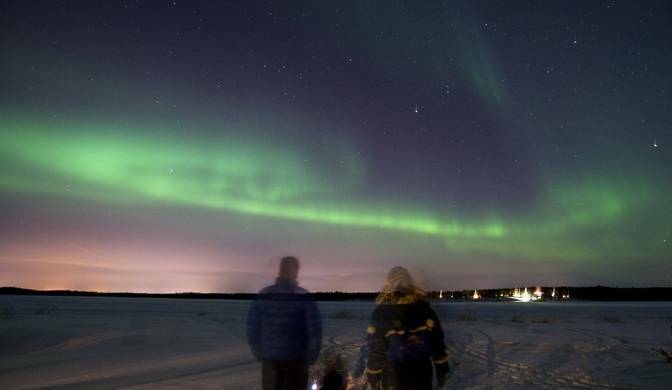 Personalise your holiday to Swedish Lapland with this tailor-made trip to Sörbyn Lodge, which boasts first-rate accommodation and exceptional Aurora potential. 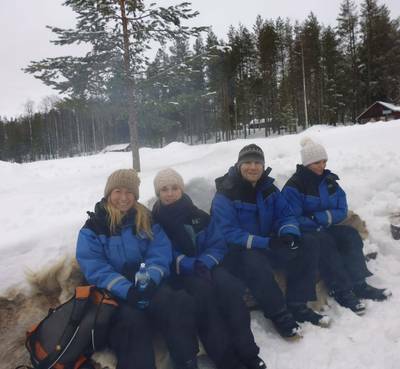 Fill your days with unbelievable experiences such as dog-sledding, snowmobiling and meeting a traditional Sámi family. 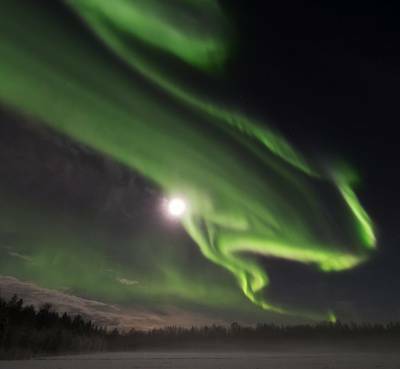 At night, decide which exciting mode of transport will take you on the hunt for the Northern Lights. A note about flights: flights are not included in the holiday price so that the best possible fares and schedule can be found at the time of booking. 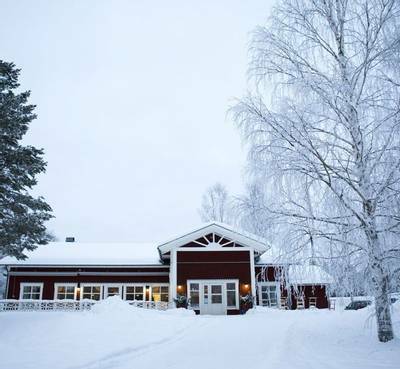 Sörbyn Lodge is a superb place to tailor a holiday in Swedish Lapland. Offering wonderful accommodation in a quiet lakeside setting, it is a destination which is well away from the tourist trail. The location also places you in prime Aurora territory and we offer a range of night-time experiences to get you on the hunt for a display. 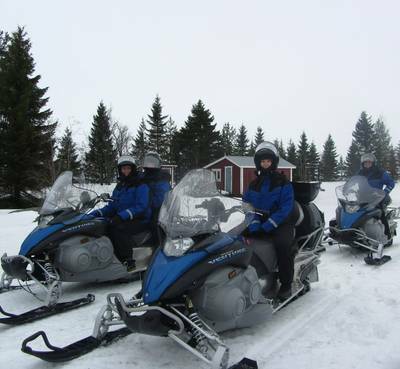 Choose from memorable activities such as snowmobiling and snowshoeing to really add to the excitement of the chase. We have a wide assortment of daytime experiences to choose from too, which are all listed in the ‘Activities’ tab. Your holiday can be as active or as relaxed as you please, letting you make the most of your time at a pace that suits you. 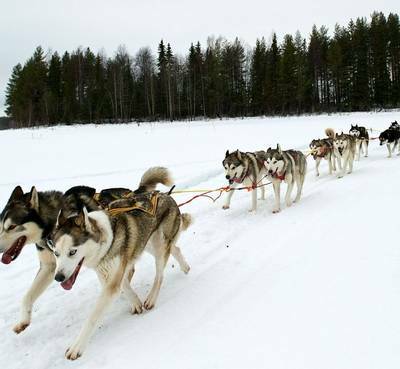 Try winter classics like dog sledding and snowmobiling. You can also do as the locals do and cross-country ski along pristine trails. For a slower paced alternative, why not go snowshoeing through the silent woods? To discover more about the culture here, you may choose to spend time with members of the Sámi community and learn about the lifestyle of Sweden’s indigenous people. Our Aurora Travel Experts are, of course, always on hand to help you design your ideal itinerary. With an activity selection to suit all tastes, this holiday provides a fully customisable winter experience in a brilliant Northern Lights location. What’s more, Sörbyn Lodge is renowned for its restaurant, where the team serves up local delicacies with passion and flare. It’s the perfect base for your once-in-a-lifetime holiday, designed your way. Please note that some activities require a minimum number of participants to operate. Schedules are always subject to change and are subject to availability. Lying in the heart of one of the most beautiful areas of Swedish Lapland, Sörbyn Lodge is an absolute gem that we cannot recommend highly enough. 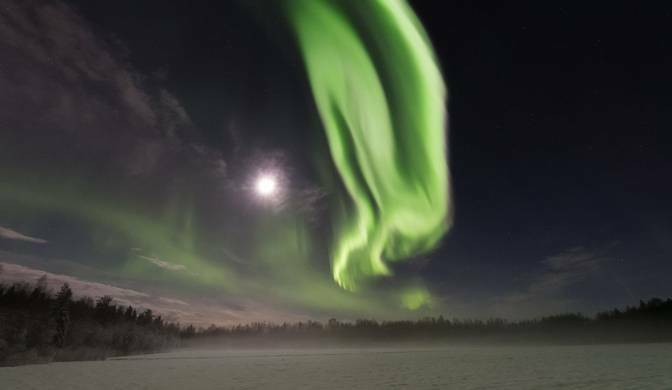 Nestled on the edge of a frozen lake, it is an exceptional Aurora viewing spot, should the conditions be favourable. One of the most appealing features of the area is that it remains relatively undiscovered in tourism terms. Therefore, you will immediately sense a more personal ambience. Developed with a huge amount of input from the community and family-run, the atmosphere truly reflects this. 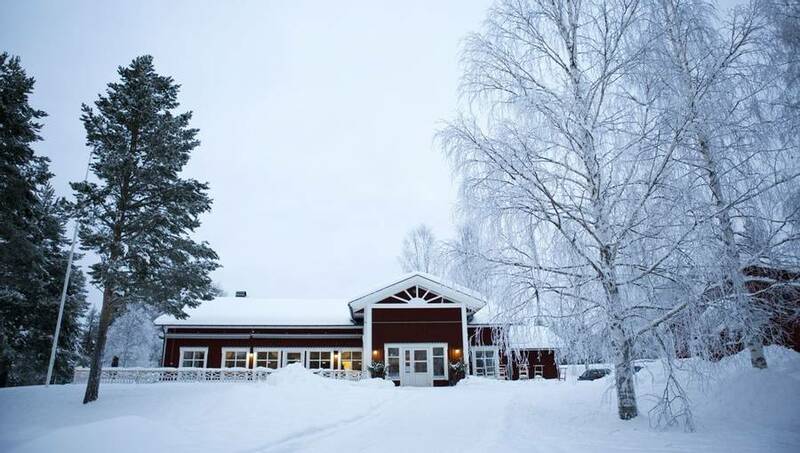 Sörbyn Lodge is located on the edge of the village of Sörbyn, approximately one hour from Luleå Airport. The hotel restaurant (situated in the main building) is one of the finest in the region. The team crafts and presents the local produce to a very high standard. A well-stocked bar and lounge area (with a large log fire) provide the perfect setting for an after-dinner tipple. Tea and coffee making facilities are available in the corridor of the accommodation wing. Guests can also use the traditional sauna, just a short walk away. This can be pre-booked locally (additional charges may apply). The eight guest bedrooms have been uniquely designed to reflect the climate in this part of the world. Well-furnished and offering the modern comforts of TV and WiFi, each guest bedroom has an ensuite bathroom with toilet and shower. With only eight rooms, this is small-scale accommodation at its very best. There are a number of cabins which guests can choose to stay in for the duration of their holiday, just a short walk away from the main lodge. The recently renovated cabins offer guests their own space in which to relax after a day of activity. All meals are served in the lodge's main restaurant so you can enjoy the delicious menus on offer during your stay. These cosy cabins feature one bedroom with either a double or twin beds and a sofa bed in the living room. The living room is a great place to relax after a day exploring the wintery surroundings. The cabins have their own small kitchenette so we recommend taking your own tea and coffee supplies if you would like to enjoy hot drinks during your stay. The cabins have their own private bathrooms with hairdryers. 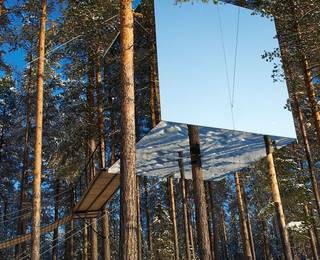 An incredible example of the talent and imagination of Swedish architecture, the Treehotel is one of the most sought-after accommodation options in Swedish Lapland. Here you can spend the night in one of the remarkable concept rooms. 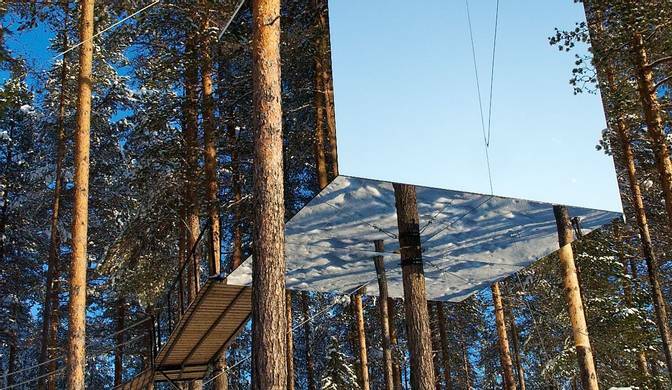 Choose from The UFO (any sci-fi addicts dream), The Bird's Nest tucked high up in the trees, The Mirror Cube with its stunning exterior, The Cabin with its delightful interior or The Blue Cone which offers wonderful views a bit closer to the ground. All of the rooms are surrounded by the forest and offer an unforgettable place in which to end your holiday. This one night package is an ideal extension to your trip and includes an overnight at the Treehotel (based on two sharing a tree room, excludes The Dragon Fly), a delicious three-course meal at the nearby Britta's Guesthouse, breakfast and transfers to the airport the following day. 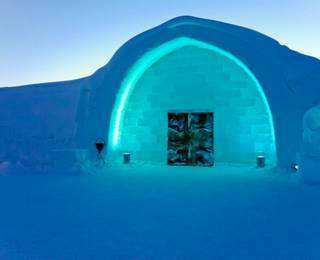 Located on the banks of the Torne River in the village of Jukkasjärvi, the ICEHOTEL® is the world's original ice accommodation. 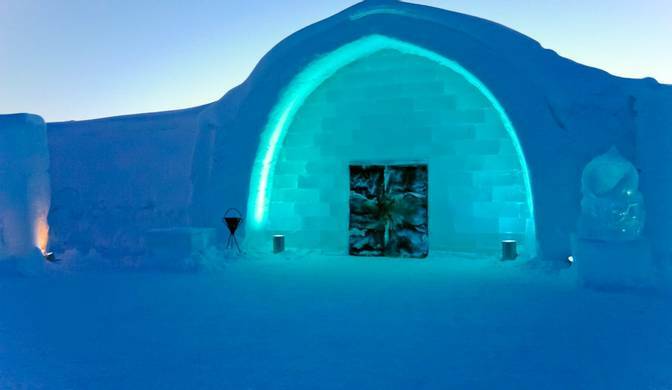 Containing deluxe rooms, art suites, an ice bar and a sculpture hall, a night at the ICEHOTEL® or ICEHOTEL 365 is like entering a fairy-tale. Behind each large door or curtain is a room decorated in sparkling blue and white. The sculptures are incredibly lifelike and you can almost sense magic in the air. You would be forgiven for wondering whether they come alive when nobody is around. There is a sense of anticipation on entering each room as you are unsure of what realm you are likely to venture into and what you expect will be very far removed from the reality. Staying in the rooms themselves is like being cut-off from the real world. It is such an inconceivable notion and very different to our daily lives that you are likely to spend your first few moments simply marvelling at your surroundings and wondering how you got there. A night here is a must for anyone visiting Northern Sweden. 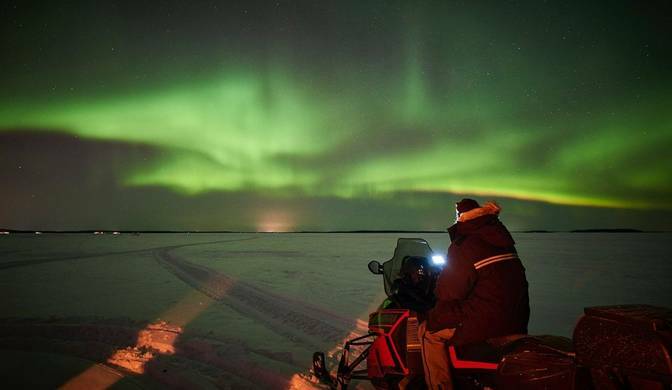 After a transfer to the start of the tour route, you’ll learn how to safely operate the snowmobile before you begin your journey to search for the Northern Lights. 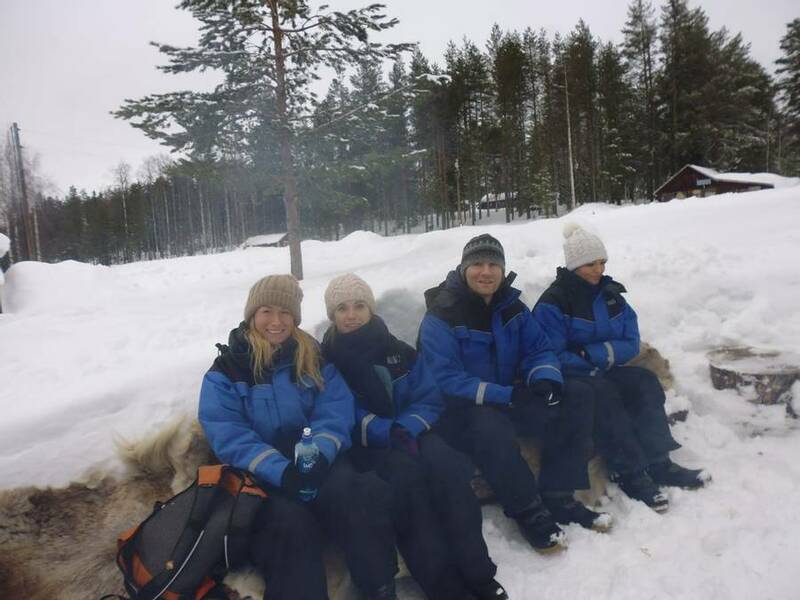 Riding two people per snowmobile, you will follow a guide along the Råne River and stop at the Gumberget Mountain to take in the view and hopefully, the Auroras dancing above. It will be possible to swap the roles of driver and passenger along the way. It is also possible to upgrade and travel one person per snowmobile but a supplement applies. Anyone wishing to drive a snowmobile must be at least 18 years old and in possession of a full driving licence. Ice fishing is a popular activity among locals and you’ll see why when you head out onto the thick ice and try your luck and getting the catch of the day. The guide will teach you how to drill a hole and set up your fishing line, and will also offer tips and tricks to make the perfect catch. Sit back on reindeer pelts with a hot drink in hand as you admire your surroundings and wait for a bite on the line. 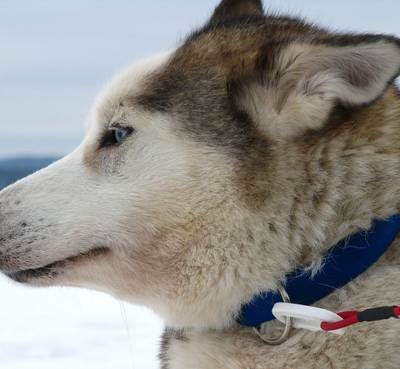 Dog sledding is an Arctic adventure you simply can’t miss during your visit here. 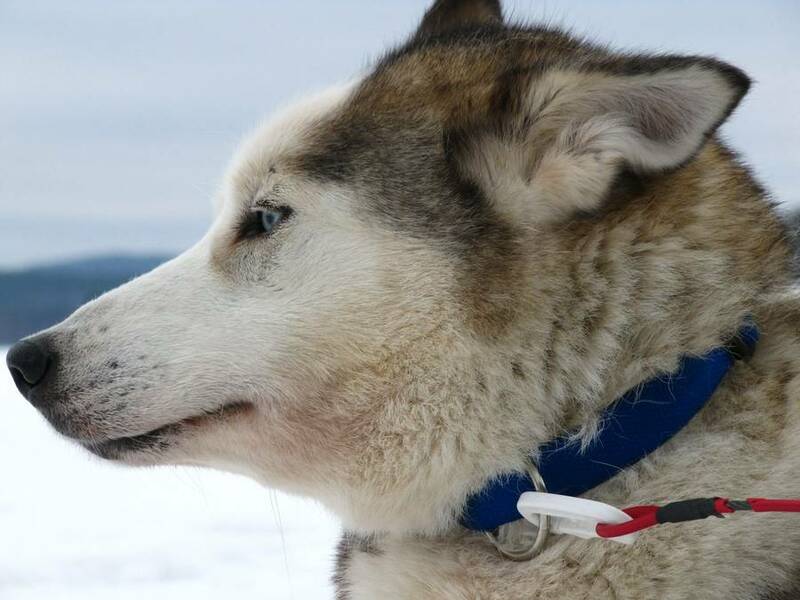 The rush of the dogs powering your sled through the white outdoors is indescribable and it is little wonder that this activity is one of the most popular daytime winter experiences. 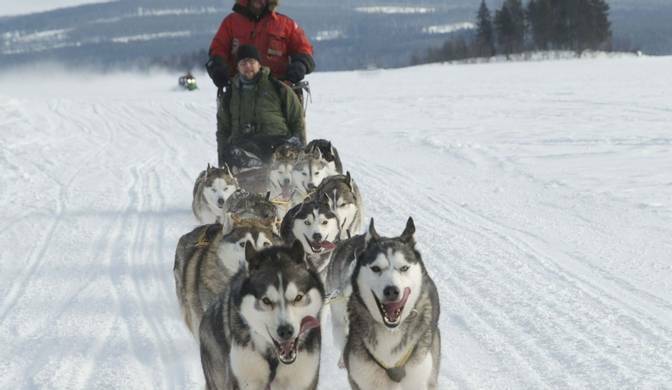 Travelling two per sled, you will have an expert musher driving you along so you can sit back and enjoy the winter surroundings. Depending on the weather and the decision of your guide, you will either hunt for the Northern Lights in a 4x4 or a snowmobile-pulled sled. Both have the advantage of speed to get you past areas of cloud cover and into a range of Aurora viewpoints. You will enter the Råne River Valley which boasts a selection of peaks that are excellent for Northern Lights viewing. Some have a direct road to drive straight up or others will require you to walk up with a head torch lighting the way. At the top, you will enjoy a barbeque with sausage and hot drinks by the campfire as you scan the skies for the magical light display. 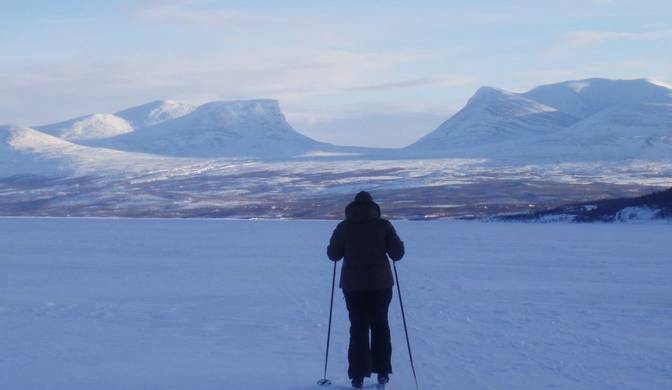 Experience a much-loved pastime of the area during cross-country skiing. You don’t need to have skied before to try this exciting way to explore the snowy surroundings. You will be transferred to the start of a forest route before learning how to use the skis. From here, you will glide through the woods learning about the flora and fauna along the way. After a break for hot drinks, you will continue through the forest before being transferred back to the Lodge. After securing a pair of snowshoes to your feet, you will follow a guide into the forest and on the hunt for the Northern Lights, stopping along the way for a hot drink. Snowshoeing is a popular activity that helps you travel with ease over the deep snow. Using head torches to guide the way, you can admire how the landscape transforms at night but make sure you always keep an eye on the dark night sky. 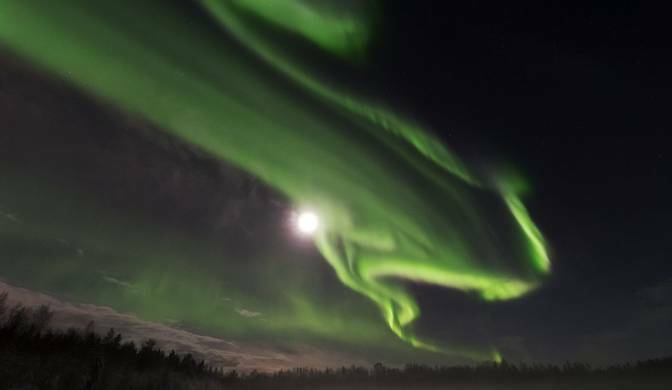 With any luck, the Northern Lights will make an appearance above you. Snowshoes help you easily walk over thick snow, to areas that would be otherwise inaccessible. 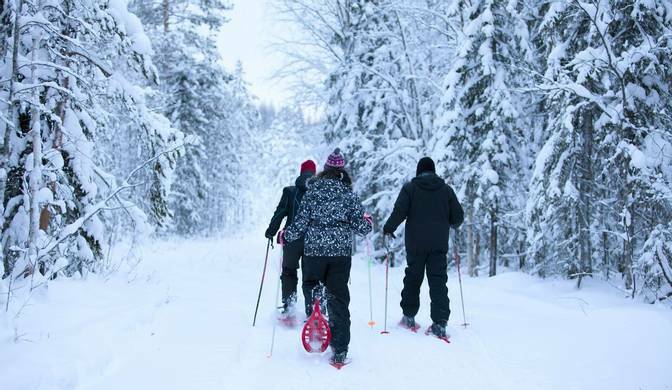 Discover more of incredible Swedish Lapland as you follow a guide into the forest, learning about animal tracks and local flora. There will be a stop along the way for hot drinks before you make your way back to the Lodge. 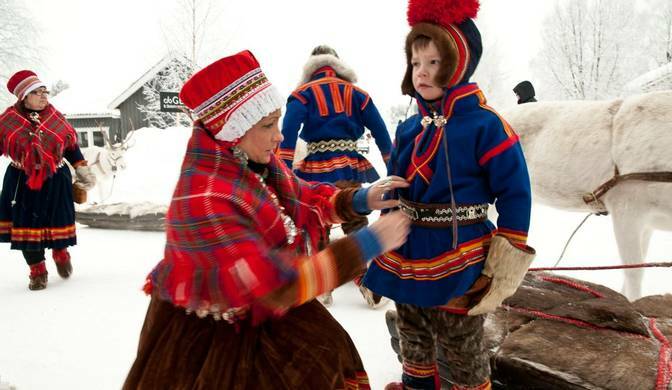 Gain an authentic insight into the native Swedish culture during this visit with a Sámi family. 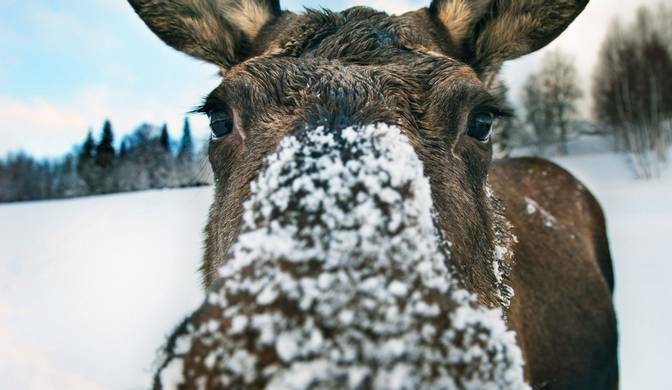 The Sámi are the indigenous people of Scandinavia – they have maintained their reindeer-herding lifestyle in this part of the world for countless years. You will meet the Eriksson family to learn about their way of life, both past and present. 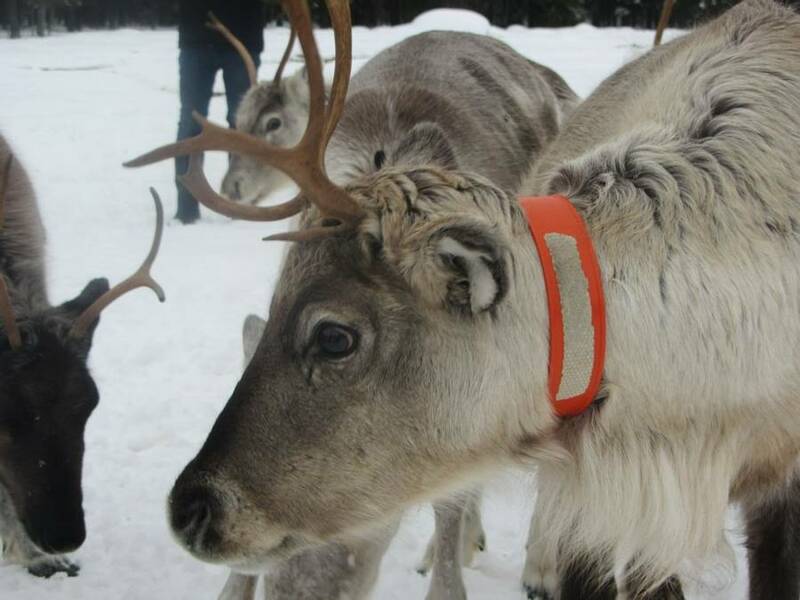 Greet their reindeer before enjoying a specially prepared lunch. You’ll also see more the surroundings during a short woodland hike. 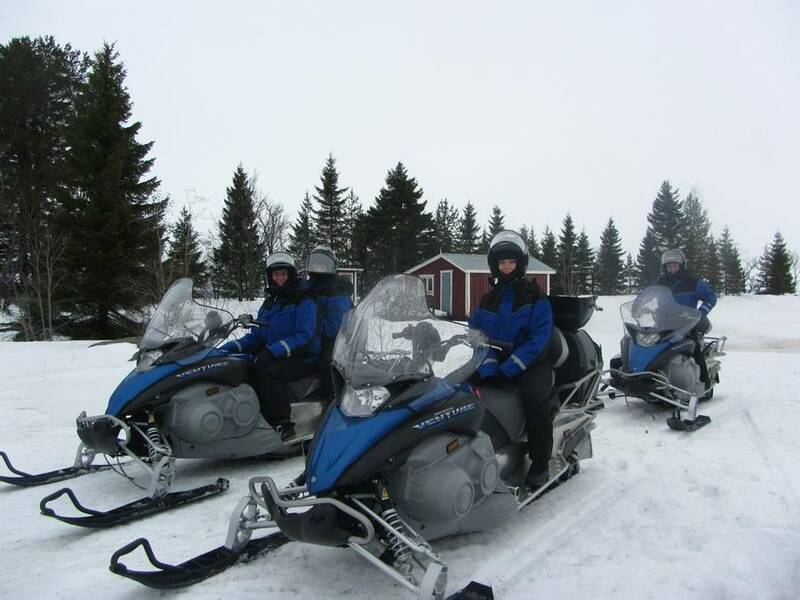 Snowmobiles are a thrilling way to explore the winter landscape. After receiving full training on how to drive the machines, you will follow your guide along a route beside the icy Råne River and into the white countryside. 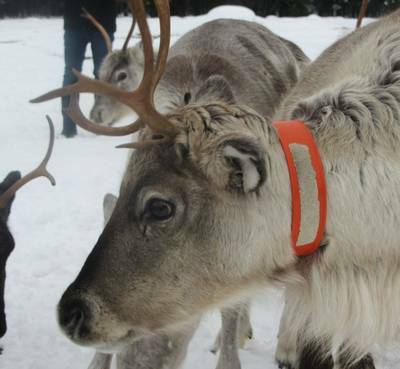 There will be a stop at Gumberget Mountain, which offers magnificent views over the valley and you may be able to spot reindeer and other fauna in the area. You’ll enjoy a hot drink as you admire the impressive scenes around you. You will travel two per vehicle and it will be possible to swap the roles of driver and passenger along the way. 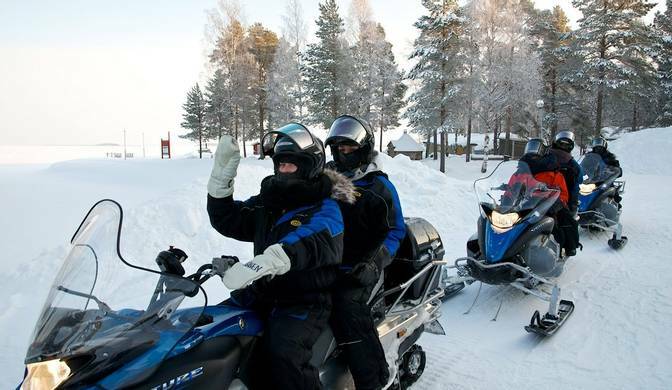 It is also possible to upgrade and travel one per person per snowmobile (a supplement applies). Anyone wishing to drive a snowmobile must at least 18 years old and in possession of a full driving licence. Search for the Northern Lights via traditional means as you take to kicksleds and slip away into the night. The local guide knows the areas away from light pollution and to the best Aurora viewpoints. Here, you can relax and look to the skies – with luck, there will be wonderful displays to greet you. During this activity, you will travel across the snowy landscape and on the lookout for moose. 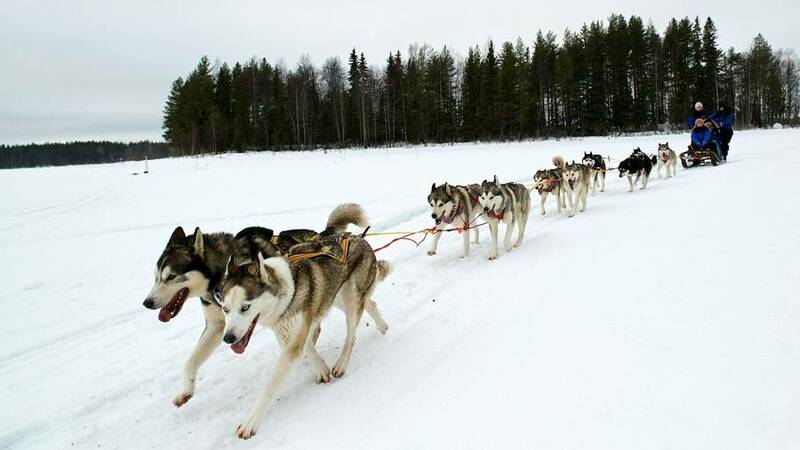 Depending on weather and the decision of your guide, this will either be done in a 4x4 or snowmobile-pulled sled. Either way, this exploration experience will have you seeing more of your surroundings and hopefully, some of the native animals. There will be a stop for a barbeque with sausages and hot drinks by the campfire.